I have never taken my health for granted as I have never been fully healthy. I was born with Mitral Valve Prolapse, which causes my heart to generate PVCs, Premature Ventricular Contractions. I was diagnosed with Diabetes 20 years ago. I have Meniere’s Disease. I have severe GERD, which has necessitated my having undergone 16 or 17 EGDs. Last year I had two cancer scares. Why am I writing about this today? Well, at 4:30 this morning my wonderful wife had to take me to the ER because the PVCs were out of control, at least from my perspective. As I wrote here I have been experiencing far more PVCs/flutters than normal and actually have my first appointment with a cardiology practice on Monday. Anyway, I am home with all blood work being normal and the doctors seemingly not too concerned about my condition, especially since I am seeing a cardiologist in the very near future. Don’t take your health for granted, even if you’re healthy, and never be afraid or hesitant about seeking medical help. I received a comment from a reader that the WordPress spam filter flagged, which meant I couldn’t edit the comment. I either had to approve it or delete it. The post was so filled with spelling and grammatical errors that I chose the latter course of action. The reader wanted to know why this blog isn’t linked elsewhere on the Internet, like Linkedin or Facebook. The simple reason is that I have no presence on “social media.” I think that phrase is an oxymoron. I did have a Linkedin profile, but after a few years I realized it was of no value to me at all. Without a STEM degree, or Ph.D. or Ivy League degree, and with not much besides baseball in my profile, I was never going to find a fulfilling and interesting work situation on Linkedin (which I think is a joke) or anywhere else. I also think it’s a joke that someone with my skills and experience cannot find such a work situation. Once again, America is drowning in credential-ism and age discrimination. I think this blog is a great example of my work. I am very proud of it; I just wish it were read by many more people. Over 95% of Disaffected Musings readers are from the US. That may seem logical to you, but in my previous blog (the one deleted by the Evil Empire, aka Google) almost 15% of the readers were from outside the US. Perhaps that difference simply reflects a contrast in the Blogger and WordPress platforms. While in my previous blog France and Portugal were the countries with the most readers outside the US, for Disaffected Musings Canada is, by far, the non-US country with the most readers. Once again, that does seem logical for an English language blog written in the US. “By the mid-1950s, Canada’s industry was booming, with new plants and facilities, increased employment and a return to export sales as Canadian manufacturers took advantage of the fact that European makers were still recovering from the war. But, by the early 1960s, the industry again faced difficulties. US-owned Canadian Big Three branch operations began importing an increasing number of cars and parts from the United States that were not made in Canada. Given the proliferation of styles and models, Canada’s plants simply could not keep up with the Canadian consumers’ demand for the latest models; they also could not keep up with the latest technological developments, such as the increasing popularity of automatic transmissions. As a result, in the early 1960s, the [Canadian] federal government embarked on a number of initiatives to boost exports from Canada to the United States, and also to prompt the US car companies — and the American government — to rethink the automotive trade and production relationship between the two countries. After a series of incidents, including a confrontation over imported parts and a tense round of negotiations, what emerged was the 1965 Canada-US Automotive Products Trade Agreement, or Auto Pact. The Auto Pact was a unique trade regime managed by Canada and the United States, with the active participation of the major manufacturers. In exchange for tariff-free trade in autos and parts between the two countries, the two governments and the auto makers agreed that the Canadian branch plant operations of the Big Three would build as many cars and trucks as they sold in Canada and maintain a base level of spending in the country. In a side-deal between the companies and Ottawa, the manufacturers also agreed to increase their auto investment in Canada for three years, and spend the equivalent of 60 per cent of their sales on Canadian operations. At the same time, 50 per cent of vehicles exported from Canada to the United States had to be built in Canada, preventing a foreign company from setting up with the sole purpose of re-exporting from Canada into the United States cars built outside North America. A hybrid form of conditional free trade, the Auto Pact created one, continental, unified auto industry. Now, Canadian Big Three plants built for all of North America and American makers could export to Canada duty-free. As this article later states, the Auto Pact was superseded by a 1989 trade agreement between the US and Canada and, later, by the adoption of NAFTA in 1993. In addition, the Auto Pact was ruled illegal by the World Trade Organization in 1999. To extreme “free traders” trade agreements of any kind are anathema. They believe in unfettered trade between different companies and consumers of different nations. In general, I believe in free markets, but I also believe that no paradigm is appropriate 100% of the time. I think that, sometimes, Adam Smith’s “invisible hand” gets lost. By the way, tariffs are the antithesis of free market capitalism. From oldcarbrochures.com a picture of a 1966 Studebaker. 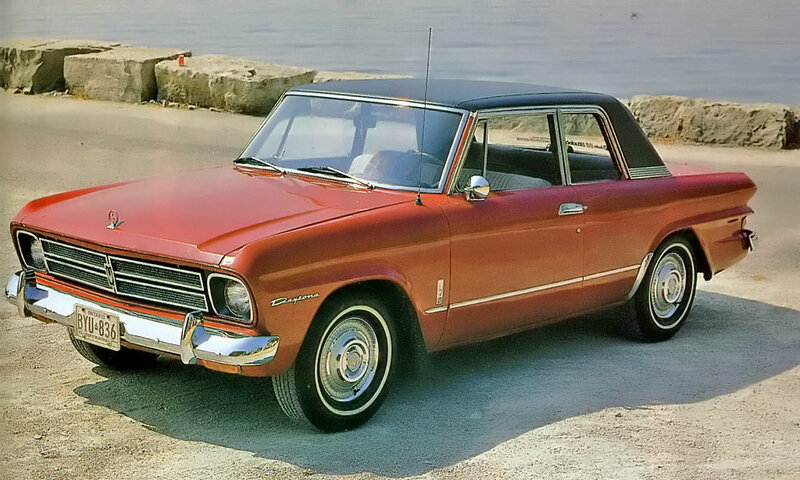 All model year 1965 and 1966 Studebakers were manufactured in Hamilton, Ontario, Canada. I actually think this car is quite fetching, but how much of that feeling is really my “defunct make syndrome” I can’t say. I would very much like to read comments from my Canadian readers.